If there is anything that can be tricky when painting miniatures, it is the camouflage, tartan, trousers and capes of Barbarian tribes. Sometimes we may not know where to start, what colour to use as a base, what colours will create a better contrast, etc. Some of the most complex WWII camo patterns are those of Germans, especially the Waffen-SS. 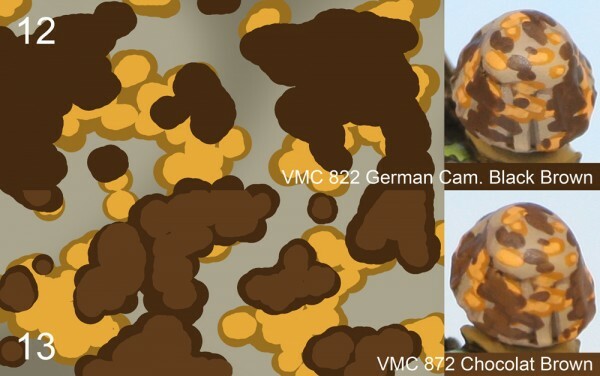 In this case I am going to explain the method I usually use to paint the Early War Waffen-SS uniforms, specifically Spring Plane Tree camo pattern and Autumn Plane Tree camo pattern. 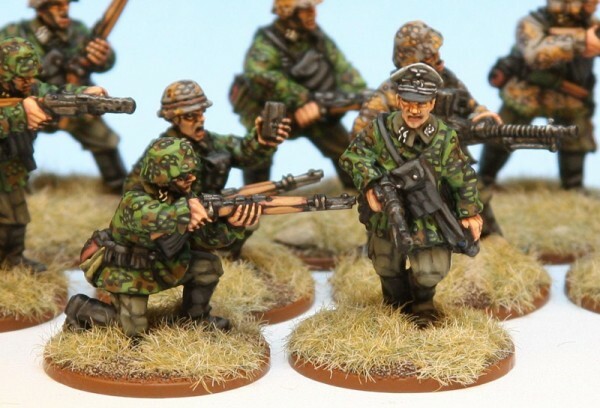 We must bear in mind that we are painting 28mm miniatures, so we are looking to paint them approximately rather than an exact copy of the uniform. I have simplified the scheme and even exaggerated the size of the patches and dots, as well as the contrasts between the different colours in the pattern. 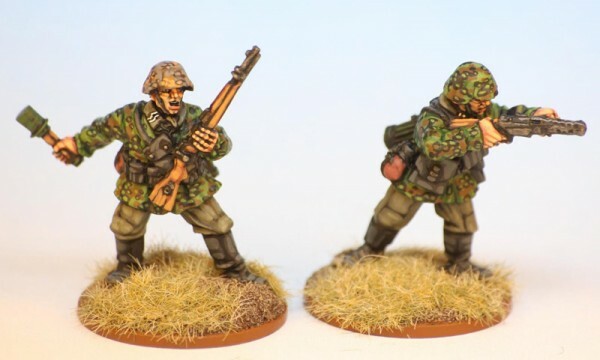 The aim is to make the miniature stand out on the gaming table and be recognisable at a distance, while still looking characteristically like Waffen-SS. This is the same exaggeration principle that can be applied to the rest of camos and complex schemes on miniatures from other sides and periods. This is not by any means the best of methods or the one that works the best – it is just another method that I have preferred to use. I painted the camo after the miniature was finished, but it can be done at any other time, even before painting the rest of the miniature. It depends on how comfortable you might feel or if you are ‘scared’ of spoiling areas that are already finished. 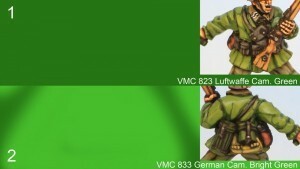 The colour references are from Vallejo Model Color (VMC) and Vallejo Panzer Aces (VPA). I’m giving colour references for Wargames Foundry too (F). 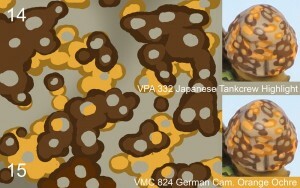 I started with VMC 823 Luftwaffe Cam. 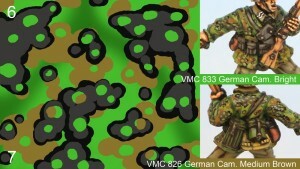 Green/F 70B French Dragoon Green as a base colour (fig.1) and I applied VMC 833 German Cam. 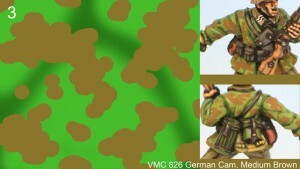 Bright Green/F 70C French Dragoon Green highlights to enhance the folds on the smock fabric and on the helmet cover (fig.2). Then I added irregular patches using VMC 826 German Cam. Medium Brown/F 121B Dark African Flesh (fig.3). For this, the painting should have a texture similar to milk – half paint/half water. That way it is possible to apply the paint smoothly and carefully. One way of doing these patches is to paint overlapping oval shapes, a few smaller dots or spots will work fine. The following step is to add the patches with VMC 850 Black/F 34A Black(fig. 4). Repeat the same process as with the brown patches, covering some of them and making sure that at the end we get approximately the same surface covered with each one of the camo colours. To fade the black a little, if necessary, add dark grey highlights. In this case I have used VMC 995 German Grey/F 39B Storm Blue (fig. 5). Now all that is left to do is to add dots irregularly, using VMC 833 German Cam. Bright Green/F 70C French Dragoon Green on the black and brown patches (fig. 6) and a few dots using 826 German Cam. Medium Brown/F 121B Dark African Flesh (fig. 7). That way, it looks like the colours of the patches are visible through the spaces between the patches on top (in this case black on brown and the green base; brown on the green base). 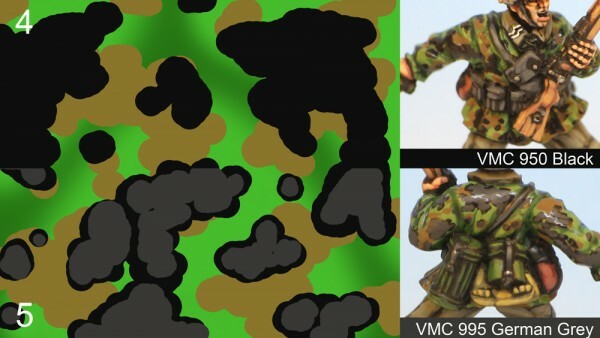 One way of making the uniform look more lifelike is to paint a few patches at either side of some of the straps and belts, to highlight the fact that the rest of accessories are worn on top of the smock. For the Autumn Plane Tree camo pattern I followed the same procedure as the Spring Pattern, but adding another highlight to one of the colours. 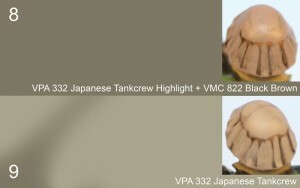 I started with VPA 332 Japanese Tankcrew Highlight + just a little bit of VMC 822 German Cam. 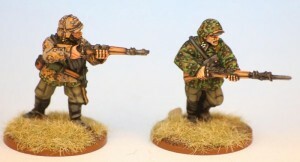 Black Brown/F 85A German Splinter Tan for the base colour (fig. 8) and I highlighted the folds on the clothes using VPA 332 Japanese Tankcrew Highlight/F 85B German Splinter Tan (fig.9). 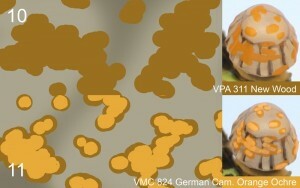 I used VPA 311 New Wood/F 45B Deep Brown Leather for the patches and painted them the same way as on the Spring Pattern (fig.10) but this time I added highlights with VMC 824 German Cam. Orange Ochre/F 7A Buff Leather for greater contrast (fig. 11). After doing this I painted the VMC 822 German Cam. Black Brown/F 72A Musket Stock Brown patches (fig. 12), and then highlighted them with VMC 872 Chocolate Brown/F 42A Bay Brown (fig. 13). 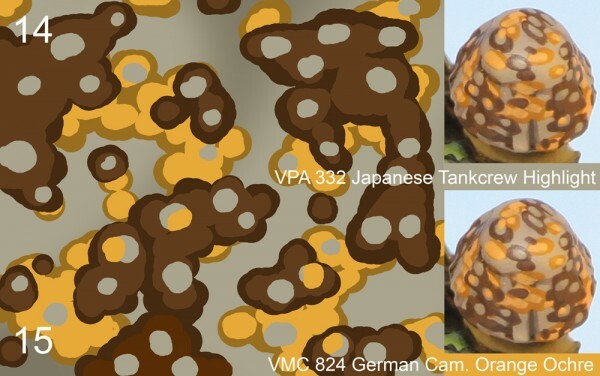 To finish off, I added some more irregular dots with VPA 332 Japanese Tankcrew Highligh/F 85B German Splinter Tan on the brown and Desert Yellow patches (fig.14), and then some dots using VMC 824 German Cam. Orange Ochre/F 7A Buff Leather on the brown patches, to create an effect of overlapping patches that can be seen through the spaces between them (fig. 15). After the painting is finished, it is advisable to varnish the miniatures. A coat of gloss varnish will provide a protective layer, and a coat of matt varnish will cover the gloss from the gloss varnish. If the gloss layer is not applied, it is always convenient to apply the matt varnish at least to get rid of the gloss that is left when some colours dry. We can mix both Plane Tree Camo patterns on the same miniature (and in the same unit), for example, Spring pattern on the smock and Autumn pattern on the helmet cover (or vice versa). 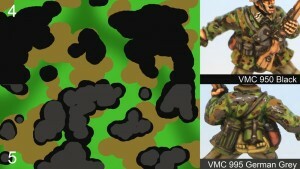 The resulting camo will enrich the miniature and add life to the game. It may look complicated at first but it is a case of practising and painting several miniatures at the same time.